Running Preggers: Trail, road, or treadmill? Sometimes we don’t have much of a choice about where to run, but some of us are lucky and have many options. Over the last few years, close to 100% of my running has been on trails. It has been amazing, but now I have to adjust back to being more flexible about where I run. I hate having to run anywhere other than in the mountains. I really do. But in reality, I know that there are actually few runners who are able to run exclusively on the trails. Running while pregnant makes you take a lot more into consideration when you are choosing your running routes. Safety and listening to your body become even more important when you’re pregnant. I’m not saying we runners throw caution to the wind when we’re not pregnant, but when it’s just you, you’re more willing to deal with uncomfortable conditions and slightly higher risks. During the first trimester, and longer for some women, you must contend with being tired and not feeling well (morning sickness). Both of these can put a huge damper on running, especially, if you have the option of sleeping in later and just running on the treadmill or road instead of driving to the mountains. Throwing up while running is not something unusual in the ultrarunning world, but it’s also not something we want to deal with during every run either. Choosing a short loop route closer to home or a treadmill when morning sickness is lurking around every corner is more appealing. Then if something goes wrong, you have the option of stopping right away and getting home or at least somewhere more comfortable quickly. The trails are ideal for the increased urination problem, at least for those who have no qualms about peeing in the woods. Roads make it difficult because you have to plan routes with bathrooms at regular intervals. However, that may not solve the problem. In my experience, there is no predictability to when you will need to go. Sometimes it’s every thirty minutes; sometimes it’s every ten. I can’t seem to make it longer than 45 minutes when running. What’s worse is you may not realize you need to go until you bounce just right and then you have to go RIGHT NOW. Falling is something you want to think about too. When I wasn’t pregnant, I didn’t like falling, but the chance of falling never stopped me from bombing down the side of a mountain. Now, I think a lot more about the risk of falling a route poses. Early in pregnancy falling is really unlikely to harm the baby. Even into the second trimester, baby has a lot of room to move and is protected by muscles and amniotic fluid. As baby gets bigger, they don’t have anywhere to go to get out of the way of an impact making the risk of falling increase throughout pregnancy. The shift in your center of gravity adds to the likelihood of falling too. As does the instability of your joints because of the hormone relaxin (more on this in another post). Weather is another thing that plays a bigger roll in deciding on a running route when you’re pregnant. I’ve always said there’s no bad weather, only bad gear, but when you’re pregnant, that’s different. Extreme high and low temperatures have a bigger impact on you when you’re pregnant and ice. Rain shouldn’t be too problematic as long as you stay warm. Ice and snow are another problem entirely (see previous paragraph). As far as calories go, they get used up quicker the further along you are in your pregnancy. In the first trimester you shouldn’t need to adjust calorie intake. Starting with the second and then throughout the third (and if breastfeeding) you’re going to need more calories, 300-500 extra per day. This could mean taking something small on shorter runs. A two-hour run was no problem without calories for me, now that I’m just past twenty weeks pregnant I’m starting to feel the drag in the last 30 minutes. Air quality is the one thing runners, along with everyone else, pregnant or not, should take into consideration when deciding where to run. You need your lungs and heart. Running when pollution is thick in the air will increase your risks for health problems in the present and in the future. One thing that the ULTRA research study has uncovered is a higher rate of allergies and exercise induced asthma in endurance runners and one of the hypothesizes is because we’re out in the pollution more than the average person, we develop these types of problems more than others. When you’re breathing for two, it’s even more important for you bite the bullet and run indoors on a track or treadmill. I hope you all had a Merry Christmas and will have a Happy New Years! My running update: I’ve developed a bit of pain in my left knee, which I think is begin caused by all the treadmill running and lack of foam rolling. I’ve backed off my miles this week, but plan to bump them back to the 36 miles as soon as my knee is feeling better. 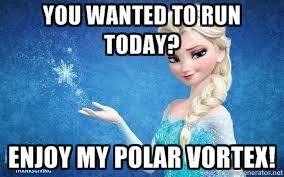 From your first winter run, it becomes obvious that the cold weather impacts your performance. Depending on where you live, you’re likely to find holiday themed 5k and 10k races throughout the winter, but there are longer races out there too including a 50k and 100 miler. You can check out the Susitna 100 in Alaska here. Not up for an ultra in the winter, that’s alright. 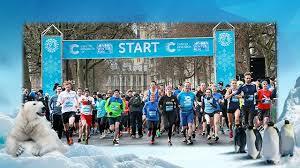 Even the 5k and 10k will provide some steep competition, so you’ll need to be training and that means running under the same conditions as what you’ll be racing in. 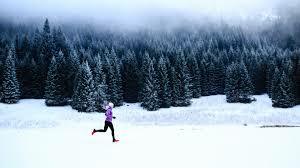 When you run in the winter, your body relies more heavily on carbohydrates and less on your fat stores. This means you’re going to need to increase your carbs-on-the-go intake while you’re running longer distances. Your muscles don’t contract as powerfully in the cold as they do when it’s warm. This means you have to recruit more muscles to get the job done. You need more oxygen in colder temperatures to produce the needed energy to sustain you through your runs because you need more muscles to help out. This extra oxygen produces more lactate, which means you’re likely to feel like you’re working harder. Also in the winter, your body has the extra load of making sure you stay warm. Staying warm takes a lot of energy. To help with this, make sure you’re wearing clothing that’s appropriate for the temperatures. Maintaining a constant pace rather than speeding up and slowing down, as you would in intervals, is much easier on your body because it can be really difficult to warm up after you’ve cooled down. Make sure your body is warmed up before you start your run. You don’t want to be sweating, but you want to be warm including your fingers and toes. Hydration can be especially problematic in the winter because your body doesn’t have as much of a thirst response in the colder temperatures. The problem is you lose a lot of water from not only sweating but breathing. Carrying water during the winter is difficult on long runs. I always recommend a hydration pack because carrying a frozen handheld is just not going to work. To keep your water from freezing add an electrolyte to it and make sure the tube is insulated. Once you’ve finished your winter race, don’t stand around; get out of your wet clothes and into a warm shower or blanket as soon as you can. Enjoy some hot chocolate by the fire, you’ve earned it. Here are some ideas/tips/tricks of the winter running trade to help you get through the cold months to come. Don’t want to buy Yak Trax? That’s okay. You can take an oldish pair of running shoes that still have some decent life left in them and modify them. Go to your local hardware store and buy some hex head screws or sheet metal screws (you don’t want flat headed screws). They need to be about ¼-3/8ths in length. You need a bunch of them. Screw them into the bottom of your shoe so the head is out to grip the ice. Wear ski goggles to protect your eyes from the cold and snow. A neck gaiter to protect your neck from exposure and a mask if the cold dry air bothers your lungs or makes you cough. Use a thin layer of Vaseline to protect any exposed skin, including your lips. Colleges and University campuses are great places to run because they have lots of cleared sidewalks without motorized traffic. They clear their sidewalks regularly and are usually the first to do so. They have their own maintenance crews and don’t have to wait on the city or county to clear things. Run with the wind in your face on your way out and the wind at your back on your return trip. During your run, you’re going to get hot and sweaty and having the wind at your back is much better than having it in your face. If your shoes are soaking wet when you finish your run, stuff newspaper into them to absorb the water and to help maintain their structure. Don’t put them in the dryer or the oven. It will ruin them. Here is a guide on how to dress depending on the temperature outside. I found this at RunnersConnect.com. Runnersworld.com has something very similar. Runners World also has this nifty “What to Wear Tool” that takes into consideration your gender, temperature, wind, conditions, time of day and intensity before it pops out a clothing recommendation. Find it here. This is my first post about running while pregnant. I don’t plan on making all my posts about running while pregnant, even as I get further a long in my pregnancy. But, I do plan on throwing them in here every so often. I know from searching online there’s a lot of personal stories about running while pregnant and what women were running and not running while pregnant. And while all of this is very encouraging and useful, I find that it’s also a little lacking because it doesn’t go into the changes that occur in your body when you’re pregnant and how those change running. So, that’s what I’m hoping to do with my pregnancy posts. One of the things that began to plague me from early in my pregnancy is the congestion. At first it was only at night. Now at 19 weeks, it’s all the time. The increased congestion is caused by a couple of things. The increased blood volume and hormones. The increased blood volume and estrogen cause swelling in the lining of the nasal passages and that causes more snot. The extra blood also causes the tiny blood vessels in your nose to swell. All of this leads to what has been coined pregnancy rhinitis. Being congested while you run can be interesting. As your body temperature increases, the snot clogging your noes gets runny, which means you can breathe again, but there’s a cost. It can make your throat sore and irritated because its running down that way or it can make it, so you want to snot rocket all over what ever happens to be to your right or left. For me, that’s another person since I’m running on the treadmill (too much pollution outside). Another pleasant result of the snot beginning to run is then it makes you cough or sneeze. Pregnancy Rhinitis can begin around eight weeks of pregnancy (yep) and then continue until you deliver the baby. After the baby, it should stop within a few weeks. Having allergies makes things worse of course and the constant stuffy nose can lead to sinus infections. So what can you do about it? If you start your run all stuffed up, it’s going to make things more interesting when you get going. Using a humidifier at night will keep the drainage action going and help you start your run with clear nasal passages (you have to buy one for the baby anyway, might as well make sure you chose a good one and see how it works). Use saline drops or spray to clear your noes before your run or inhale steam. If it gets to be too much, contact your doctor or the mother to baby hotline 1 (800) 822-2229 or email them expertinfo@mothertobaby.org They are the experts of what goes through mom’s system and into baby’s. They have tons of research on hand on what medication, vitamins and all sorts of other stuff can be harmful to a baby growing in utero. I know knowing how much you can run while you’re pregnant is a challenge and it’s all subjective. Let your body tell you how much is okay and be prepared to listen. I’ll post how much I’m running each week at the end of my pregnancy posts, but again how much you should run while pregnant depends on many factors. Make choices best for YOU and YOUR BABY. Weekly miles: 36, running three days a week.